Where is our all-inclusive local media source, one that is not generic, yet doesn't cater to only one group, one that embraces local lore, custom and myth, one that encourages people who live the story, who are located downtown or in the community, whose lives are on the pulse of the daily, local narrative? They are to tell their story, to emphasize selected statements said by their own voice, and to speak from experience, because good media should begin with experience and end with experience. Good media should not begin with inexperience and end with inexperience. Good local media should reunite with social cause, and ultimately, incite action. 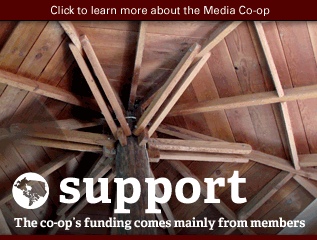 The introduction, history, structure and funding of The Media Co-op is explicitly written out in, Know Your Co-op, a nineteen page document prepared by journalist Dawn Paley in 2007 and self-published by The Dominion editorial collective. 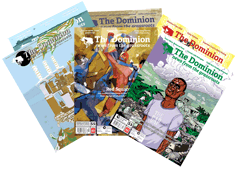 What began in 2003 as a newspaper, The Dominion (still circulating nationally), was reincorporated as a multi-stakeholder cooperative in 2007, now known as The Media Co-op. Cooperative and local media is a process of decentralization, essentially giving media back to its rightful source: the people. In this way, the oft-repeated slogan, “Own Your Media” is The Media Co-op mantra. 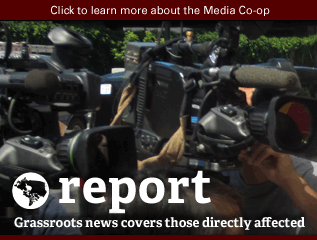 With stories such as the 2004 Haiti coup d’état and the Vancouver Olympics, The Media Co-op and its locals transcend corporate media coverage, connect with untapped readership in the Canadian public and have worked with larger media organizations internationally, such as Democracy Now! Yet, as typical to news media, the bad news is ever-present. 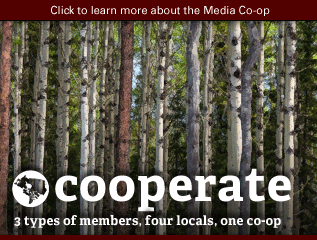 As reiterated in Know Your Co-op, Montreal Media Co-op founder Dru Oja Jay, bore the bad news that The Media Co-op could not accept new locals in the 2010 article, How to start a local of The Media Co-op. Due to the overwhelming commitment and the underwhelming budget, The Media Co-op instead encouraged incipient Working Groups. The Calgary Working Group was opened under the direction of Jay in 2010 with top-notch international reportage on the challenges to a national election in Manila, Philippines. Since then, the Calgary Working Group has received over 120 members with contributions on topics ranging from the G20 Summit to The Alberta League Encouraging Storytelling (TALES), to Environmental Justice, to Café Koi to Young and Future Generations Day. 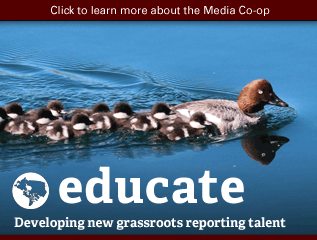 Articles, podcasts, photo essays, editorials and blogs are among the many mediums of cooperative journalism local to Calgary. After a new (and very active) Calgary Working Group contributor corresponded with Jay earlier this year, the momentum shifted. Dialogue on starting a new local of The Media Co-op reopened. The potential for the Calgary Working Group to become the Calgary Media Co-op is a vision that has since been shared in the local community, and the support is gaining. The Calgary Working Group started meeting with this objective in May of 2013. Besides forming a basis of unity, and establishing an editorial collective, the Calgary Working Group requires sustained and significant contribution in order to shift gears into the full-fledged Calgary Media Co-op. 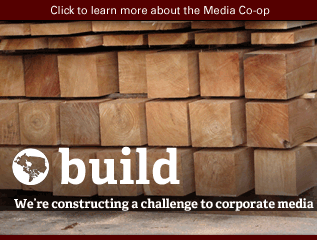 The initiative is mutually coordinated with The Media Co-op, where all posts contributed to the Calgary Working Group (and in the future the Calgary Media Co-op) will appear as published on The Media Co-op nationally-syndicated, online news source. Stories written by a local, such as the Montreal Media Co-op, also appear as such when published in The Dominion. 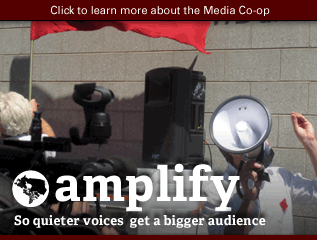 The Calgary Media Co-op is a vision for local cooperative media, in advocating for the publication of local stories, connecting them to a national community of journalists, activists, communities and leaders. The basis of unity and editorial collective has been organized successfully since May with core organizational capacity developed with Daniel Rodriguez, a graduate of SAIT Journalism and Melissa Manzone, who holds an M.A. in Journalism from Kingston University (U.K.). Our basis of unity establishes a rational, concerted response to the inadequate agenda of dominant media to address and give voice to local concerns, perspectives and narratives. The unity is also founded on a deep appreciation for journalism as a public base of knowledge where cooperative values are formed, maintained and encouraged. The editorial collective organizes a weekly program of contribution. Each piece submitted to the collective will be edited by at least two other core or guest editors. Three pieces a week are to be contributed by one regular contributor and two guest contributors. The publication schedule will be organized according to three themes – Uncovered, Alternative and Editorial. On Monday, the focus will be on misinformation in the dominant news sources. Simply, we ask, “What is the popular news not covering?” The same issue published in dominant newspapers will be assessed and critiqued with regard to the uncovered angles, perspectives and stories. Not only will contributors critique, their articles and/or multimedia pieces will address and give agency to the unvoiced, and unknown, in our community. On Friday, the editorial collective will publish editorials spotlighting special voices from within the community. This new initiative of the Calgary Working Group aspires to convene with the entire political spectrum, including all identities of class, religion, gender, and ethnicity into a refreshingly local forum to reenergize debate, understanding and willpower in the community. 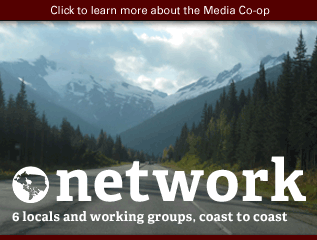 The Calgary Working Group still has a long way to go until the proposed momentum is established, and finally, there is a new local chapter of The Media Co-op in Calgary. According to the latest draft of New Local Policy (pending issue by The Dominion editorial collective), the Calgary Working Group remains in Phase 0 of 5 successive stages until a full-fledged Local can open in Calgary. First and foremost, what this means is that the Calgary Working Group may not use The Media Co-op name to raise money. All funds currently fostered through the voluntary leadership of media activists involved in developing the Calgary Working Group are nominally channeled through AlternativeMediaYYC.com, an independent media and podcast source for Calgary-based voices. At Phase 0, the Calgary Working Group may not refer to itself as the Calgary Media Co-op. At this initial stage, administrators at the Calgary Working Group helping with site content do not have editor access through working group admin privileges. Currently, the Calgary Working Group is developing from a working group (Phase 0) to a website working group (Phase 1). 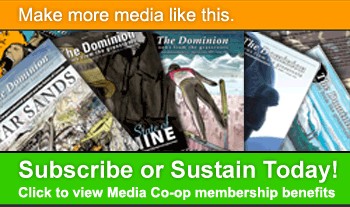 In the first stage of the working group’s becoming a local new content is posted weekly, collective membership is stable and meets regularly; collective processes, membership criteria and operating principles are formed; editorial policies are adopted; formal agreement is made with The Media Co-op basis of unity; and lastly, the collective (Calgary Working Group) agrees not to use The Media Co-op name to raise money nor refer to themselves as the Calgary Media Co-op. Good media begins with the very real ground-level experience of people who are the subject of good stories. The middle ground is where people read and learn. Finally, good media ends when the lives of the people voicing their story are changed as often as the people who learn that story. Good media compels and instills action. Mediocre or god-awful media begins with inexperience, namely the daily political rhetoric, hearsay, or at best a secondary source. Next, its core value is the repetitive sound of a cash register receiving a dollar and some change for a paper. For the tremendous act of reading is enough for some literati, however news media should be a call to extroversion and community. Oftentimes, media consumerism ends with apathy, inaction and at best a satiated boredom, and at worst, accepting that life merely boils down to hearsay. More subtly, office-enclosed research on secondary sources so conveniently bolsters today's social (and unsocial) media frenzy; a frenzy that can overwhelm experience into the dull silence of an unprovoked voice in an abyss of unquestioned answers, facts, statistics, records. The glossy overdub display of empty space is often filled with meaningless advertisements, meant to convince people that their lives are as empty and meaningless as an unfulfilled consumer niche, such as the newspaper; slowly becoming a dying, trivialized miscellany for the intellectual exploits of the few. The media less and less provokes action because it never quite does anything for anyone, yet still somehow exists because of the inkling that it could. If only media behaved as it once did before politicized buyouts and delegitimizing advertisements, when a paper was a conduit of experience through which new learning passed to connect, share and welcome all voices to truly and transparently voice an urgent cause to act! Dominant news sources less and less provoke action, and more and more reveal mere dangers. Is our fear-based culture a result of the classist leadership in dominant sources of media and information in the public sphere, where stories are always politicized according to the dominant agenda? As a result the rhetoric dissuades change, i.e. delegitimizes alternative perspectives. The narrowing national and public debates are also a resultant of the unremitting and domesticized war on [domestic] terror and its repercussions within the consumer identity crisis of the West. Local media often promotes reliable, ongoing coverage, because people are interested in the longstanding nature of their community. Merely because a story is told does not mean the story itself is over. 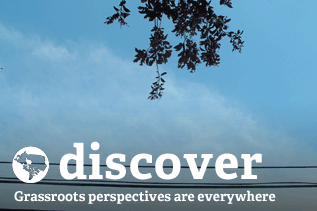 Ongoing coverage on a topic that immediately concerns people, on which they have daily experience as a default to their local lives, provides opportunities for readers to learn more, gain news perspectives, contact key leaders on the issue, and most importantly, become involved in currents of change. Dominant papers don't often voice underprivileged perspectives because they are the least marketable consumers. Instinctually, good journalism bolsters weak areas of coverage, not simply profit margins. As Pete Hamill wrote in News Is A Verb, “True accomplishment is marginal to the recognition factor. There is seldom any attention paid to scientists, poets, educators, or archaeologists.” Traditionally, papers lead communities toward mutual solutions and shared vales. Consumer marketing instills myopia and is, finally, beside the point, and decidedly antithetical to providing true information. The advent of community, as opposed to commercial, journalism can teach citizens of a democracy (and more, a democratically inclined world) how challenging it is to create consensus. Journalists are practitioners of democracy. Their work necessitates service and humility. Community journalism cultivates voluntarism, and promotes education, vision and friendship. An unknowing public spawns a culture of denial, impotence and misinformation. The more a society realizes its source of community, the more its people are independent, thoughtful and generous. Hamill, Pete. News Is A Verb: Journalism at the End of the Twentieth Century. The Ballantine Publishing Group. New York. 1998. Page 80. Miller, John. Yesterday’s News: Why Canada’s Daily Newspapers Are Failing Us. Fernwood Publishing. Halifax. 1998. Pages 15-16. Kennedy, Dan. The Wired City: Reimagining Journalism and Civic Life in the Post-Newspaper Age. University of Massachusetts Press. Amherst & Boston. 2013. Paley, Dawn. Know Your Co-op. The Media Co-op: http://www.mediacoop.ca/index.php?q=knowyourcoop. Canada. 2011. Jay, Dru Oja. How to start a new local of the Media Co-op. The Media Co-op: http://www.mediacoop.ca/blog/dru/4378. Canada. 2010.